Surprise dad with this rustic gift basket for fathers filled with delicious gourmet goodies and keepsake plaque paying tribute to him. 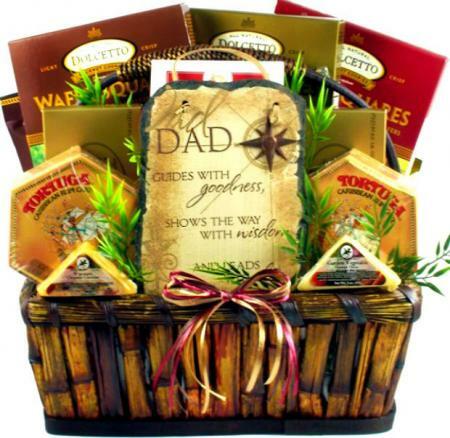 Dad will love this large gift basket with all of its rustic charm! It arrives filled with a wonderful keepsake slate plaque that pays tribute to him, along with a large selection of delicious treats that he will be able to enjoy on his special day! Imagine his excitement as he digs into this gift basket! *Slate plaque features a distressed printed facing and dimensional compass adornment. With leather cord hanger. Measures 6" x 8". Two convenient sizes available. Select desired size at checkout.